You may find the following websites useful or interesting when planning a trip to Wales. As the list of accommodation providers we work with, and/or supply bikes to, is getting ever longer, we've decided to move them to a separate page, which can be found here - accommodation in Wales and the borders. A great comparison site allowing you to search for the best-value car hire. Discover the magic of Mid Wales via the Heart of Wales railway line. This great little train is combined with cycling in our self-guided Heart of Wales itinerary, taking you through 'a land of lush rolling hills and crystal clear mountain streams'. Use this website to plan your journey by train. A Brecon-based taxi company with a difference! Ride and Hike provides a pick-up and drop-off service for cyclists and walkers. Perfect if you fancy walking or riding a linear route. Groups of half a dozen can be accommodated thanks to a six-seater vehicle and a six-bike trailer. Talgarth airfield is home to a small but active gliding club, in the heart of the glorious Black Mountains. Learn to fly or try a taster session in what must be one of the most stunning outdoor classrooms in the World! Visit the National Cycle Collection in Llandrindod Wells (about 40 minutes' drive or a pleasant bike ride from Hay) and enter the World of the Bicycle. Journey through the lanes of cycle history and see bicycles from 1819, such as the Hobby Horse, Boneshakers and Penny Farthings, up to the most modern Carbon Fibre machines of today. Situated on the banks of the River Wye in Glasbury, 4 miles from Hay, the centre hires out Canadian canoes and kayaks. Paddle downstream to Hay-on-Wye in 2 hours, or to Whitney (a 10 mile, 4 hour trip). The hire fee includes collection and transport back to Glasbury - or you could always paddle one way and pedal the other! Learn how to take great pictures with a professional photographer on location in the stunning Brecon Beacons. The friendly, fun courses are suitable for beginners or enthusiasts and can be booked for half a day or a full day, 1to1 or for up to 3 people. One of the best bike shops in the Midlands, packed with everything a cyclist could want and staffed by a really helpful, professional team. This touring bike and tandem specialist is based in the Somerset town of Bridgwater. The company has incredible expertise when it comes to building bikes, supplied the bicycles for our own trans-African expedition and built the tandem for our hire fleet. Wales' answer to YouTube - a website packed with user generated content all about activities in Wales. Backed by Visit Wales, the site has lots of interesting info, and you can upload your own snaps to the growing online photo gallery. The Mawddach Way is a three day circular footpath walk around the Mawddach Estuary - a beautiful and largely unspoilt gem hidden away at the southern end of the Snowdonia National Park. A guidebook and great accommodation are available. The Mawddach Trail (as featured on the BBC's "Railway Walks" with Julia Bradbury) footpath walk and cycle route winds for 15km along the disused railway track on the southern edge of the spectacular Mawddach estuary. Whilst the trail can be joined at several points it starts at the picturesque market town of Dolgellau and finishes by crossing the iconic railway bridge over the mouth of the estuary into Barmouth. The East Cheshire Group of The Ramblers. The walking group for all of Cheshire East and surrounding areas. This group is part of The Ramblers and is one of the largest walking clubs in the North-West, with members from all walks of life throughout Cheshire East, Greater Manchester and beyond. Stacks of information about where to stay and what to do in the market town of Abergavenny - home to the Abergavenny Food Festival and a natural gateway to the Brecon Beacons National Park. 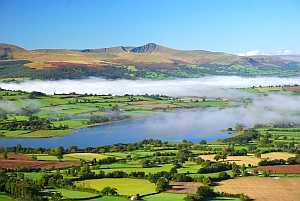 The Brecon Beacons Tourism website provides information on what to see and do in the Brecon Beacons National Park. Search for accommodation, activities, events and find out more about the local area. A great resource when planning your trip. Charming Bredwardine and Brobury are located on the River Wye, about 8 miles from Hay on Wye. The community website is an excellent source of both historical and practical information about these neighbouring hamlets. Find local information and accommodation listings for the town of Crickhowell, situated in the Usk Valley. We are based in the small town of Hay on Wye, check out the official website for accommodation listings and other information about the town. The online sibling of the successful local magazine, Wye Local is a resource for locals and visitors alike. Check out the What's On and Where to Eat sections, or post a question on the forum if you want a local recommendation or the low-down on what's happening in Hay and the surrounding area! Hay on Wye is transformed by the annual festival of literature, which was started in 1988 by a small group of local people. It now has a global reputation as one of the best book-based festivals around. Accommodation is hard to come by during the festival, but the temporary Tangerine Fields festival campsite is a great option. This festival has been going since 1995 and gets bigger and better every year. A really good opportunity to taste some of the best regional produce in the September sunshine.